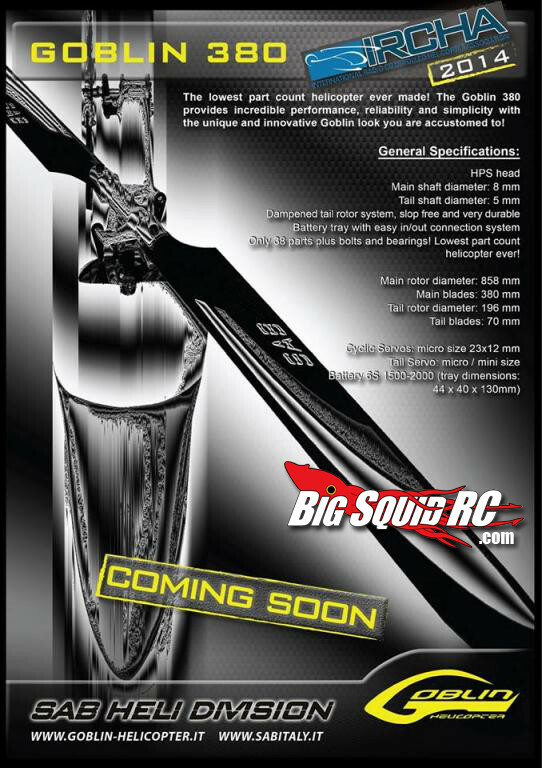 IRCHA Exclusive News: New 380 Size 3D Helicopter from SAB Goblin Heli Division « Big Squid RC – RC Car and Truck News, Reviews, Videos, and More! Hot off the press at IRCHA 2014 Jamboree: SAB Heli Division adds one more collective pitch stunt helicopter to their line: a 380 Size (380mm approx blade size)! Called the Goblin 380, this helicopter only has 38 parts outside of bolts/bearings, which is the lowest part count for a helicopter of that size, EVER! Built to handle a 6S LiPo power system, this helicopter will definitely give the Align 450L Dominator package a run for its money! No pricing, but more details to come from SAB later this month or beginning of next…for now just enjoy the flyer above. For more helicopter news on BigSquidRC Click Here.